After the disappointment of Catalonia things picked once I got into France. 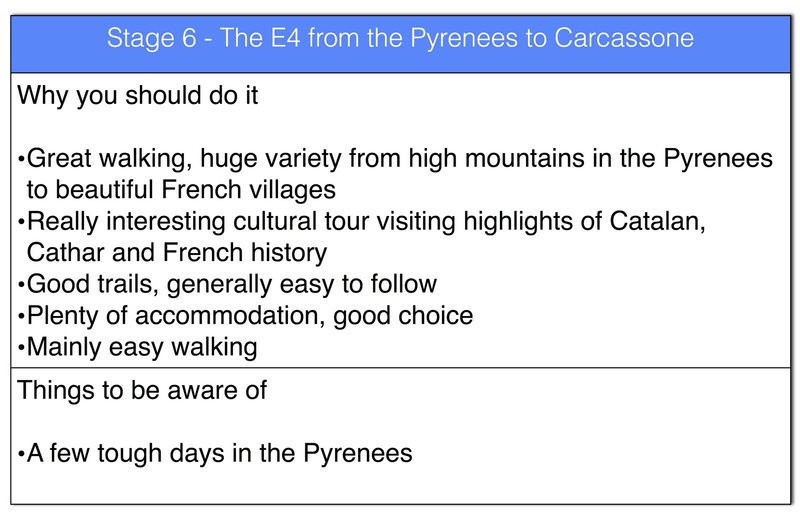 If the E4 through Catalonia was one of the worse bits of the route than the E4 from the Pyrenees to Carcassonne was one of the best. This particular corner of France is a really great place to walk and the route of the E4 captures both the area's varied and beautiful landscape and its interesting cultural legacy. From the geographic perspective the walk takes you from the top of the eastern Pyrenees, down through the foothills, crossing a series of wide valleys running east down to the Mediterranean, before arriving at Carcassonne which sits in the middle of the Aude Valley, the gap between the Pyrenees and the Massif Central. From a historic cultural perspective it's much more complicated. The area has a complex history with associations with both Catalonia across the border (Pyrenees-Orientales roughly corresponds to an area the Catalans describe as North Catalonia) as well as Occitania which extended right across southern France and into Italy. Both traditions have produced a distinct linguistic legacy which still echoes today. Particularly interesting is the Cathar history and the Albergensian Crusade which saw the destruction of the Cathar version of Christianity in the early 13th Century. Some estimate that 500,000 people were killed as a result of this crusade which transformed the area from one of the richest at the time in Europe (with a particularly important cultural tradition - home of the troubadours) to one of the poorest and most marginalised. The walk takes you through places of particular significance to this Cathar history, including lots of hill top forts. The E4 follows the route of the GR36 which, for the first three days, and after crossing the border with Spain at Puigcerda/Bourg Madame, follows the route of the GR10. These three days include the opportunity to climb Canigou, the mountain which serves as a "national" symbol for Catalans north and south of the border. It then heads north, out of the Pyrenees, and down into the heart of the Cathar country visiting one of the key Cathar sites, the Chateau Peyrepertuse. After that you visit Lagrasse, rated by some as the prettiest village in France, and then Carcassonne which of course is a UNESCO world heritage site. Not bad for 9 days walking (although much better to have gone a bit slower). After well over two months in Spain it wasn't just the great walking that lifted my spirits, it was also the sense of progress and excitement I got from crossing the border into France. Entering France rekindled some of the excitement I had when I started the walk. Some of this was the sense of progress but it was also experiencing the real differences you still get in Europe when you cross from one country to another. Going from Spain to France is a particularly dramatic change. The border itself has all but disappeared as a feature but the cultures are very different. From the perspective of a long distance walker some of these differences are important. The most obvious difference of course is the attitude to food. French people eat earlier but also take food a lot more seriously. In particular ordinary food in France - the food you get in a cheap cafe - is just much better than the ordinary food you get in Spain. On the other hand accommodation (when you can get it) is generally better in Spain than France - Spaniards are obsessed with cleanliness (use more bleach per capita than anywhere in Europe) and comparably priced accommodation has better facilities in Spain and is much cleaner. It's a cliche and a generalisation I know but in France the food was much better than the beds. The whole service sector is also different in France to Spain. There are fewer shops in the small villages (a bit like England in that respect) and, compared to Spain, ATMs are like hen's teeth. At a more practical level, French maps are much better than Spanish maps and so is the waymarking. The French Grande Randonnée (GR) network is enormous and the GR routes are marked on the maps. 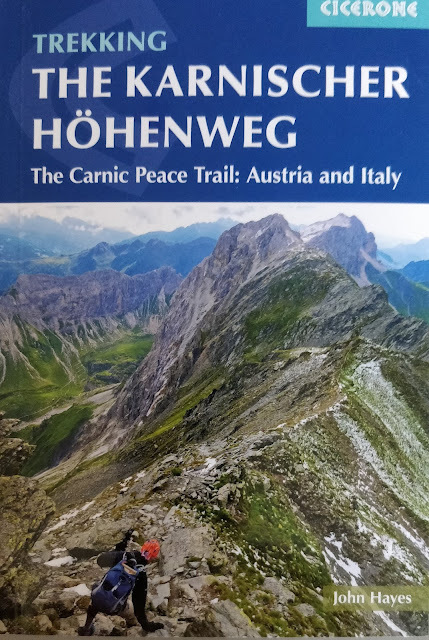 A word of warning however - they are not perfect, and it came as a big surprise to discover that on the ground the GR routes do change and the Topoguides, Maps and GPS routes downloaded from the internet don't always keep up with these changes. Some of the routes must be permissive - dependent on the goodwill of the landowner - and when this goodwill is withdrawn you can find that the information on the route is out of date. For navigation I had GPS routes downloaded from GR-Info and I had PDF copies of the relevant Institut Géographique National (IGN) maps. IGN maps are widely available and you can get them in lots of local shops. Despite the better waymarks and a good GPS trail I still made some dreadful navigational mistakes but it was always down to poor judgement and lack of attention rather than poor signs. Unlike Catalonia I could only blame myself when I went off in the wrong direction. The trip to Carcassonne took 9 days - poor weather for the first three days in the Pyrenees, good weather after that. Day one involved a trip to tiny village of Planes. After a walk across the valley from Alp, a stop off in Puigcerda, I crossed the border at Bourg Madame (a town which has perhaps lost a role as the status of the border has changed). Quickly climbed back up the side of the valley (which counter intuitively is on the south side) and passed through the pretty villages of Err and Llo before getting to the ugly ski village of Eyne. Planes is tiny, has the feeling of a Welsh mountain village (maybe is was the rain) and the Gite d'Etape there was very primitive. Next day I was joined by a friend who knew the area well, and walked with me for three days. 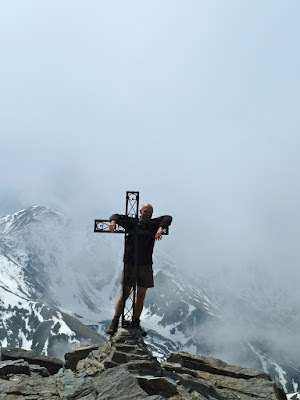 He had a tough introduction, a huge 27 kilometre walk to Mantet crossing two high passes, the Col Mitja (2367 metres), and the Col de Pal (2294 metres), the latter one in a thunder storm. It was too early in the season to stay at the Refuge du Ras de la Caranca and given the awful weather I was glad I wasn't walking on my own. Fortunately, the Gite d'Etape at Mantet, La Girada, was a wonderful place to stop. The weather had now settled into a pattern, sunny in the morning and wet, very wet, in the afternoon. Just as well that next day, the trip to the Refuge de Marialles was not so far and not so high. Just a couple of gentle passes to cross and the lovely village of Py in between to visit. The accommodation in the refuge is in a dormitory but we were the only people there so it wasn't a problem. Excellent food. 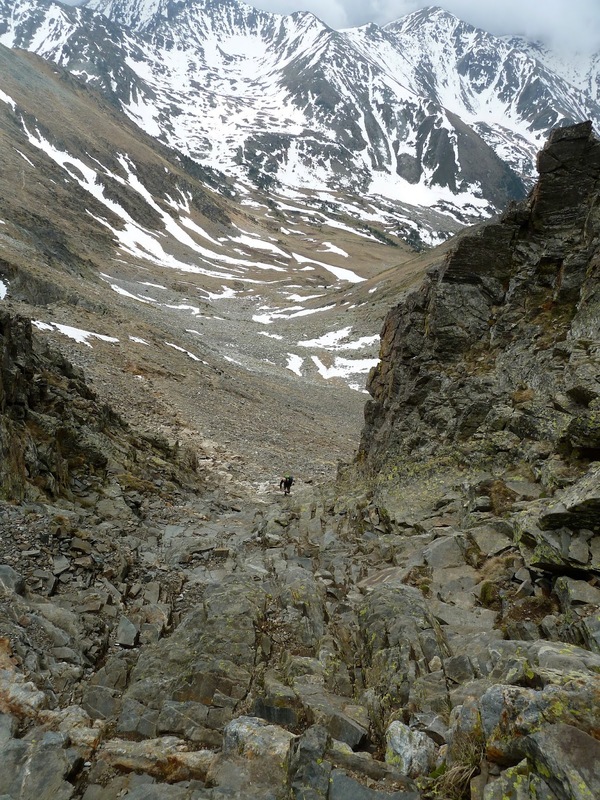 Strictly speaking you don't have to go up Canigou, the GR36/E4 goes around it, but if you have a head for heights you would be mad to miss it. Same good weather conditions in the morning, so a great walk up the valley from the refuge, out of the trees and into a lovely wide open valley full of Isards, a local species of deer, and soaring eagles. The last bit, the climb up a "chimney" to the summit was just amazing, scrambling all the way helped by fixed ropes. Got to the top just before the weather turned, and after a brief stop, at the Chalet des Cortalets, it was a long downhill romp through pouring rain to Ballestavy. I thought we were going to have to stay in a grim Gite d'Etape but the key holder took pity on us, and found us a holiday let for one night. Lovely local restaurant to eat in. My friend left me the next day and missed a great walk to Sournia. The sun was shining and the views back to Canigou and down to the Mediterranean were fantastic. You walk down a lush green valley from Ballestavy until you hit a major valley running east west (feels like the end of the Pyrenees proper), across a dam over a reservoir, and climb up again on the other side. After the alpine landscape of the Pyrenees, you're now back into a scrubbier upland Mediterranean countryside. Lovely walk from the ancient village of Marcevol through to Campoussy with first sightings of ruined Cathar castles. Was the only person staying in the Gite d'Etape at Sournia, it was a Sunday and the auberge in the village was shut. Another great walk next day, this time to Caudies de Fenouilledes. Easy walking with huge views back to the Pyrenees and the Mediterranean. The route takes you through a series of tiny little villages, Le Vivier, St Martin, Fosse and Fenouilledes, each with its own ruined castle, through a lovely gorge near Fenouilledes before arriving at the ancient and slightly run down town of Caudies de Fenouilledes. Stayed at the Cave Ancienne, a very nice auberge. Next my favourite walk of the stage, wonderful weather, great scenery everything fresh and green. After walking out of Caudies de Fenouilledes you climb up onto a ridge with yet more views of the Pyrenees. Away from the ridge you cross a wonderful upland valley, ancient pastures with abandoned farmsteads before coming back to the ridge, heading east, with the wonderful views again. After a while you loose a bit of height, have to walk along a road for a short distance before climbing up again and walking along another upland valley. Eventually you see the Chateau Peyrepertuse, one of the biggest Cathar castle ruins which, from this perspective, blends into the outline of the cliff, before dropping down into Peyrepertuse. I stayed in a bed and breakfast but the town also has a very smart looking auberge. Next day was a very long walk to Lagrasse made worse by the fact that I followed a GR36 variant which took me out of my way. I should have turned back but stuck with it and by the time I decided that it was just too far it was also too late. I ended up hitching a lift. I suspect that even if I had been on the right route it would have been a bit of a slog. Lagrasse has the reputation of being the prettiest village in France and attracts the tourists to go with this reputation - it is lovely but like something from a film set. The final day was also just a little bit too long. It wasn't so much the distance (although there was a lot of distance), it was also the endless series of gorges and valleys you had to cross enroute. I was never that high and had anticipated a fast walk but as well as walking 38 kilometres I actually climbed and ascended 1800 metres. As a consequence I got to Carcassonne a bit late and perhaps made a poor choice in terms of accommodation. There is lots, and the best choice is around the station which is where you need to be when you leave town. Carcassonne of course is an amazing place, a stunning town with its huge walls completely in place. It's also a huge tourist attraction and very very busy. Thanks for the comment on the blog. Must admit I don't know anything about walking in Bulgaria but the scenery on your website looks wonderful. Couldn't work out where the E4 went but would be very interested to know if it would be possible to walk along it and find accommodation as you went, the way I did it on my walk this year.